Here is why I thought that these would be fun: Willy Wonka. Remember the scene in the Gene Wilder version where Charlie and Grandpa Joe drink Fizzy Lifting Drinks? 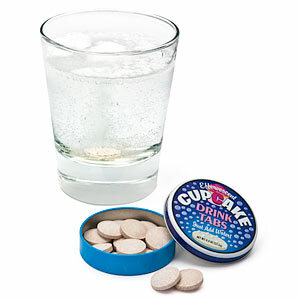 Fizzy Cupcake Drinks seemed like they would be an acceptable substitute. BONUS - it seemed like they would be fun to do with the kids. I'm bummed at what a lame entry this turned out to be, and I apologize that it's not a more interesting one. I had to post it to keep up with my food a day quota! I still love you, ThinkGeek, but this is an awful product. T-shirt repeat from day one! Also, I LOVE Eva's observation that perhaps you have to put a cupcake in it. It reminds of Day 9 when she noted that the hot chile would be hot. What a good dad! Maybe not a Gastronomic masterpiece, but the best one yet w/ the kids. I love how they've adopted your adventuresome spirit and were willing to try it, but you didn't let them be disappointed about it. I've thought several times through this project, for the most part, we never know when we're making real memories with our children. You know! They will talk about Project Gastronome for the rest of their lives. Yes, even at a young age my Ava is very good at breaking things down to their basics. "Doesn't taste like cupcakes? Put a cupcake in it. Problem solved!" Thanks Roy. For me, the funniest part about all of this is that it was just a happy accident that the kids became involved, after Blake came wandering out of bed on Day 1. They have made this more fun than I ever would have had on my own. You know how sometimes when you put little ones to bed, you hear them singing or talking to themselves for a while? The other night after we put them to bed, Ava was chanting something from her room, but we couldn't tell what it was. We got closer to her door, and heard, "Gas-tro-NOME! Gas-tro-NOME!"